The French really seem to like raw food. At least in Paris they seem to eat a lot of steak tartar, salmon tartar and raw oysters. When I was there this Fall, I never had a lunch in a bistro or cafe that I didn't see a raw dish go by...I guess their food safety is better than in the US, because I never heard about anyone getting sick. I even asked the American who brought us on a food tour about food poisoning, and she said she couldn't recall anyone she knew getting it in France. I have had food poisoning one too many times in the US, so I tend not to eat raw food... occasionally I will have sushi, but not very often. The Dorista's are making Salmon Tartare this week. I do not have a fishmonger to get sushi grade salmon from, so I decided to use the elements of this tartare to make a salsa. I mixed together the tomatoes and avocado and topped them with lime juice, olive oil, scallions, mint, tabasco and instead of chives, which was the only French seasoning, I went with cilantro, because lets be realistic this isn't a French dish... it's Southwest American. Great flavors, I will repeat this recipe again in the summer when all the ingredients are in season. Next time I will skip the expensive mint that didn't add anything to the salsa... or maybe I'll make a mojito with it instead! by Diane Balch inspired by Dorie Greenspan's "Salmon Tartare" from "Around my French Table." 1) Chop tomatoes and put into a medium size mixing bowl. 2) Top the tomatoes with scallions, cilantro, mint and then avocado. 3) Drizzle on avocados the lime juice, EVOO, and Tabasco sauce along with salt and pepper. Toss salsa and set aside. 4) In a large non-stick skillet heat 1 tablespoon of olive oil on medium-high and saute the salmon fillets for about 4 minutes per side depending on their thickness. If the fillets are thick you may want to cover the skillet if you don't want the fish raw in the middle. 5) When salmon is cooked top each fillet with salsa and serve with quinoa, potatoes, or rice. Very nicely done, Diane! Your version is delicious looking! I don’t do raw fish either…I decided to go with lox for the dish and it was very good! Happy Friday! Thanks Kathy, Lox sounds like a great idea too if I was going to make this for a lunch. That is a really funny story. Yes, culturally we don't eat raw food, but sadly our FDA is so underfunded that foods like: eggs, peanut butter, and hummus can carry some really frightening bacteria's. Just saw this article the other day: http://www.nytimes.com/2015/04/08/us/food-safety-laws-funding-is-far-below-estimated-requirement.html. So even if we did change our eating happens we would need to be much more attentive to food like the EU is. First, let me say I like your presentation, looks fantastic. Secondly, I laughed at Rose's comment because I actually ate steak tartare in Las Vegas and loved every bite. My husband was a little concerned at the time if I knew what I was asking for, but I decided to take a chance and it was fabulous. Raw fish is another story, although I tested this and disliked the lime more than the raw fish. I had steak tartare once not the way the French make it with ground beef but thin slices. It was OK, but I'm not a big fan of beef. I did eat raw pork once with a Lebanese friend more as a dare. I will never do that again. Raw fish I enjoy, but I make sure it's sushi quality. You and Jora really made some excellent (and, wise) adjustments to serve the needs of your family. Of course, you always do this. That's why I love reading your blog. Your kids at least try (I think) everything that is put on the table but you seem to always make adjustment to make it palatable to their taste. They still are experimenting with new foods, flavors and spices, but in a better and easier way. Nice photos also. Very nice. Yes, they do try everything and more often than not they will like it. These days they have become mature enough to not say, "yuck" and just eat a small portion. Raw or cooked one is more likely to succumb to food borne illnesses in one's own home as apposed to a professional restaurant with raw goods on the menu. They are trained food selectors and food preppers. Funny how mint is so expensive where you are and yet here you can buy bags of it for next to nothing. I've really learned to appreciate mint in more dishes thanks to FFwD. And yes, there is always some left for mojitos! I read that about home cooking and it makes sense because people don't wash their hands enough cooking or use separate knives and cutting boards. Yes, mint is expensive and the truth is I couldn't even find fresh chives. I looked in two gourmet grocery stores and one green market. You guys are very spoiled in CA. Beautiful, Diane! Bill would eat salmon prepared your way for sure. Though I think I'd be eating his share of salsa. This with a mojito sounds heavenly!!! Yes, I am planning to make this on a summer evening. Grill the salmon and have mojitos. Nice adaptation, Diane. I was of a similar mind on the herbs. I also used cilantro instead of both the mint and the chives. It worked perfectly! Now I'm craving a mojito. I love those. See if we all lived near by we could meet at a bar and have mojitos... virtual mojitos for all the Dorista's tonight..tchin, tchin! Your salmon with salsa looks tasty. It's always a bit of a worry with raw ingredients, but I have been lucky so far. Your dish looks delicious. 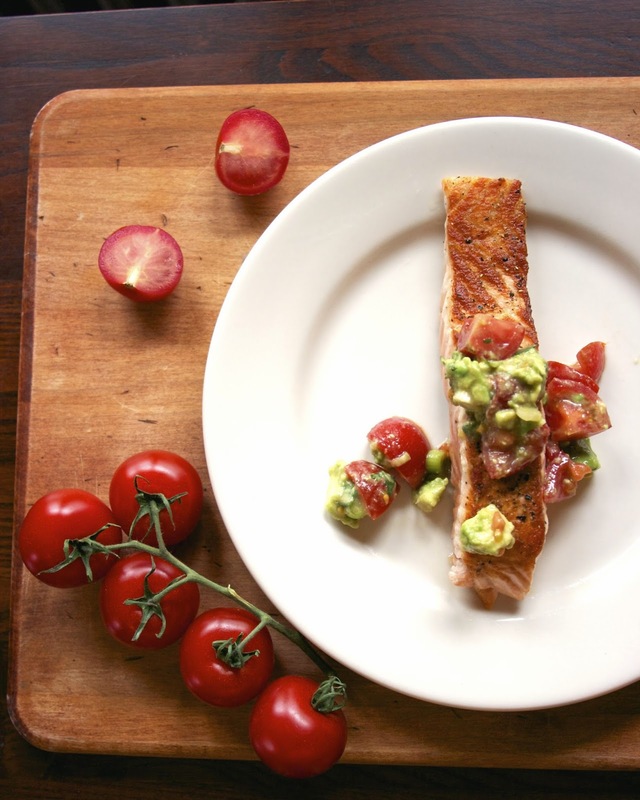 And with the grilled salmon, the avocado-tomato salsa! I was lucky and had chives and mint from the garden, so no needing to purchase for me. The combo I really love is cilantro-mint-basil, though it's a new one for me - I did not really enjoy mint before. I did enjoy the dish, but would have loved yours! I really like your interpretation on this dish. Well played! A lovely presentation and a great twist! 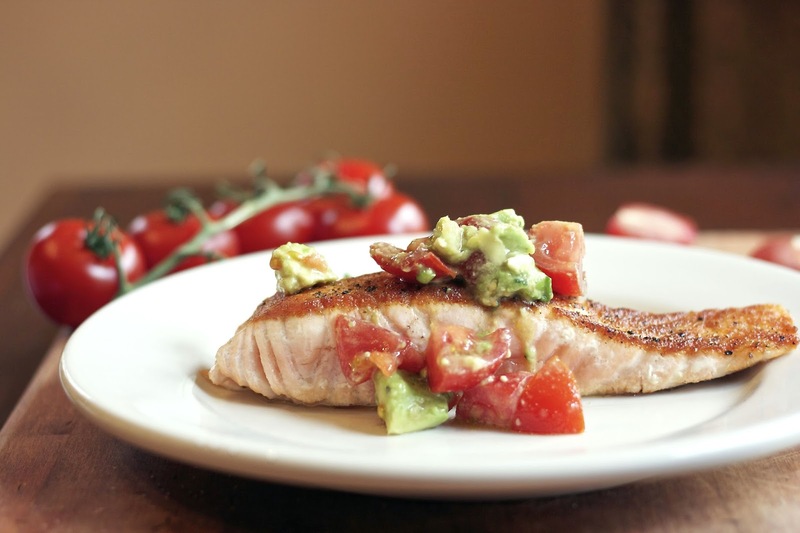 I'm always looking for a new recipe and I'm sure going to try for Salmon with tomato, avocado salsa. This dish looks mouthwatering. Thank you for sharing with the Clever Chicks Blog Hop! I hope you’ll join us again next week! I'm all about new Salmon recipes! I think this will be my new favorite. Thanks for sharing with us on Weekend Bites Diane. 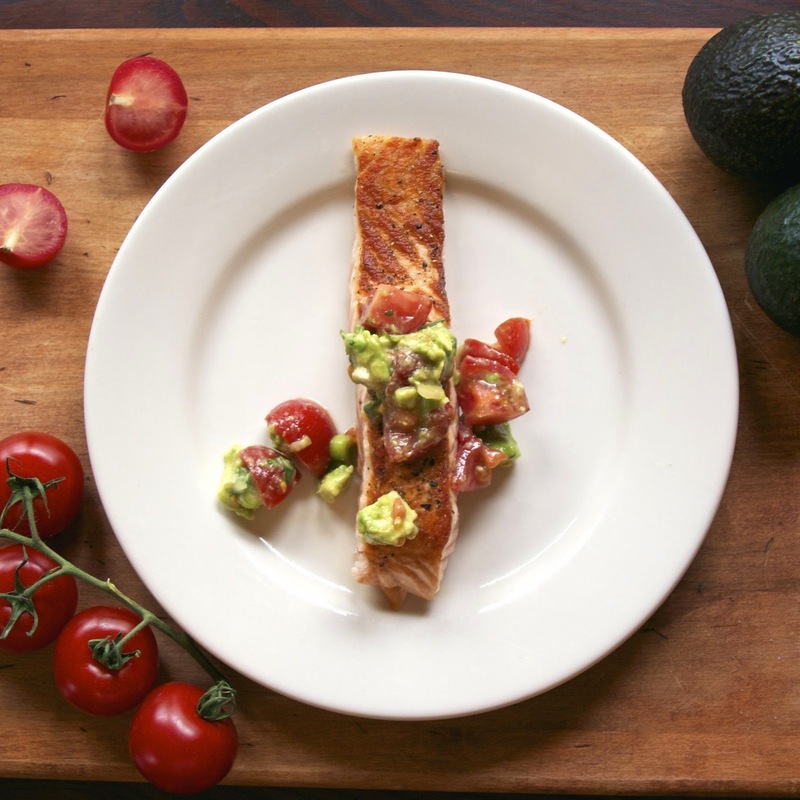 Your presentation for the Salmon with Tomato Avocado Salsa looks so pretty and I am sure would be delicious. I am "too" American I need to have it cooked, been sick to many times. Thanks so much for sharing with Full Plate Thursday this week and come back soon! Love the tomato avocado salsa idea! Looks great! Thank you so much for linking up at Tasty Tuesday! Your recipe has been pinned to the Tasty Tuesday Pinterest board! Please join us again this week!